I finished City of Heavenly Fire on May 31 while I was in NYC. But rather than jump in and review it immediately after, I kind of let it marinate in my mind for awhile over the past 17-18 days to really sum up my thoughts and emotions regarding a book that was extremely hyped, part of a groundbreaking and widely popular series by a YA literature goddess in her own right, and the conclusion to a much loved series, not just by others, but by me and also by my family. I came to The Mortal Instruments party kind of late. I had backlogged the first four books before I even even cracked the cover on City of Bones. For some reason, I was hesitant to read them. By early 2012, which was when I finally started City of Bones, the series was already extremely popular. I was still kind of new to the YA scene and had torn through about a half dozen other series before I finally decided to get wrapped up in Cassandra Clare's world, a world in which Stephenie Meyer herself has said she loved to dwell in while she read. I remember the night I cracked open the cover and read the first four of five chapters and I remember the next morning. The heat went out in our apartment and I spent the day wrapped up in every blanket I could find on the couch, being kept warm by my Golden Retriever and a few space heaters while the landlord and maintenance department fixed the problem. I don't really remember much else about the weekend because I devoured the books over the next three days with little to no sleep. And then I had to sit and wait for City of Lost Souls for a couple more months. I also remember having a serious debate with myself about whether or not I wanted to buy groceries or Clockwork Angel and Clockwork Prince, which had come out. I eventually decided on groceries (score one for adult Heather) and ended up waiting on the Infernal Devices for almost nine more months, until Christmas, when my parents got me both. They were my first reads of 2013 and they were finished in about 36 hours. I loved the Infernal Devices series to pieces. I knew within the first two chapters of Clockwork Angel that I loved it more than The Mortal Instruments. I related to and resonated with Tessa's character so much and I felt the story was so much more cohesive and organized and enchanting than even The Mortal Instruments, which I was SO enchanted by already. Now, that might be because I was coming to that series with a lot of Shadowhunter and Downworlder knowledge already. Maybe I wouldn't have felt that way if I'd read The Infernal Devices first and The Mortal Instruments second, but we'll never know. The point is, I loved that series. And in my Top 13 of 2013 (which yes, I'm still finishing because I'm not a quitter and it's better late than never), Clockwork Princess finished in second place, a close, close finish to The Coldest Girl in Coldtown by Holly Black. I didn't know at the time that the two are best friends and writing partners, but I find it incredibly fitting. Anyway, Clockwork Princess was, to me, everything that a series conclusion should be. It's not just one of my Top 13 of 2013, it's one of my top books EVER. Period. And despite my deep and undying love for The Mortal Instruments, I was starting to feel like the story had gone on for awhile and I was ready for some closure. 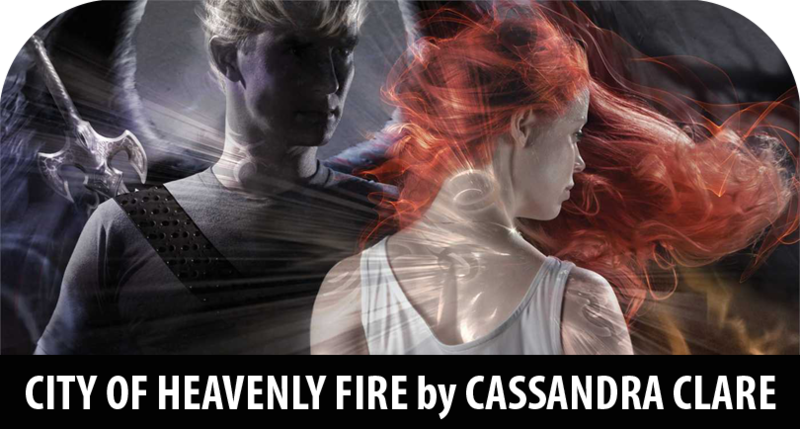 Knowing what Cassandra was capable of, I had high hopes for City of Heavenly Fire. I was lucky enough to be present in New York City for the City of Heavenly Fire launch party at the 92nd Street Y. I'd never been to one of their events (and I'll talk more about that when I'm doing my trip recap), but it was a really phenomenal and well-organized event. I've heard that 92Y events with YA authors are not very organized, but really, I think the problem is that people go to these things without educating themselves on the process. 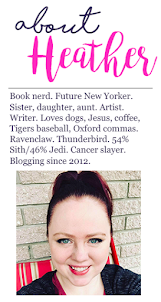 I read some recaps from other bloggers who'd been to things there before and I happened t be in line next to a group of women and their daughters who'd been their in late 2013 for the Allegiant launch party. I informed myself and came prepared. I showed up there HOURS early, not at all surprised to find a line (though relatively short at that point), and was happy to sit down with my book, a coffee, and several bottles of water. The launch really was phenomenal. Again, I'll go into it more with my trip recap, but Cassandra Clare herself was the headliner, but she brought some AMAZING authors with her, all of whom are among the best of YA's authors today and I just felt like it was a fun, hilarious night that was put together really well with the audience in mind. Having those other authors (Maureen Johnson, Kelly Link, Holly Black, and David Levithan) there was such a treat. I started reading CoHF on the subway on my first morning of BEA. I brought it as my book to read in line. This was a HUGE mistake. As anyone who was in line with me can attest, that book is like a magnet. Everyone saw it and was drawn to me, asking where I was and nearly spoiling me. And then there were the people there who were pestering me about whether or not they could get CoHF at BEA and didn't seem to understand that I had brought my own book for reading while in line. It was also a huge mistake because it's a GINORMOUS book. Every day at BEA, I had two totes. My tote for collecting books from autographing and drops and then the tote that had my personal stuff in it. Water, umbrella, book for reading in line/on the subway, band-aids, business cards, umbrella, bookmarks, etc. And the personal tote was constantly heavier than the one I was using to lug my haul around in and CoHF definitely contributed some shoulder aches. I'm a glutton for punishment, though, so I continued to bring it with me everywhere the next two days, but I always wizened up a little bit and took the jacket off so everyone wasn't immediately drawn to me to discuss the book with me. I finished it by the end of the last day of BEA, which was Book Con, and which I ducked out of early to go rest, recharge, and read the rest of the night. And since then, I've been pondering what I'd say to you all in review. I LOVED the book for what is was as a part of the story. I LOVED Cassandra Clare's writing as always. I LOVE her mind. I LOVE that she has tons of Shadowhunter stories built up in her and I love that I know I'll be returning to that universe over and over again. I envision a world where some day, you'll be able to go to university and major in Shadowhunters and Downworlders. And I enjoyed the story. You don't set aside half a day that you could be spending out and about in NYC to a book and a story you don't love. I enjoyed it immensely. I thought that the prologue was nothing short of amazing. It featured Emma Carstairs and some of the other residents of the LA Institute, which will be the focus of The Dark Artifices series, one of two new Shadowhunters sagas that Cassandra has cooking up in that brilliant mind of hers. I literally felt like my mind was a little paralyzed after it, like it needed to recover from the intensity. I was near tears on the subway because it was just that special. And that was something that was consistent throughout -- these new characters that were featured and the glimpse we got into their story, were in my opinion, the best part of the novel. They were fresh, engaging, and exhilarating. Maybe this was just my thought process. Maybe I'm alone in this feeling. Maybe this was how I felt because I was growing a little tired of the TMI characters (but still loving them). Maybe these characters felt super fresh to Cassandra, too, and that's why their transition to the page and into the story lines felt so bold and superb. For whatever reason, that prologue and these new characters were the things I enjoyed the most. And as they interacted with our pre-existing TMI characters, I felt like they breathed new life into them as well. I also feel like it was a great homage to these core five characters to see them set foot on one last adventure together. I enjoyed that. I enjoyed seeing how these friendship have all blossomed. I felt a lot like I was watching the last season of Friends, you know? Four Shadowhunters and a Vampire, all living in NYC, spending the last days of life as they knew it together before things changed drastically. I didn't HATE or even really dislike anything about this story or about the conclusion. But for some reason ... it just came up a little short of my expectations. It was not as complete to me as Clockwork Princess was. It was not as satisfying. It wasn't bad, I didn't dislike it, I actually really loved and enjoyed it. But something was just a little missing. I hated that Simon's memories were purged. And I also LOVED the way we discovered that maybe all his memories weren't totally gone, just jumbled. And I REALLY LOVED that Magnus and Izzy found a way to help him gradually regain some of what he'd lost. And that he might now, finally, become a Shadowhunter? HOW FREAKING AMAZING WOULD THAT BE? That would be AMAZING. But ... now I want to know what happens next for Simon. And I feel like a whole new series could be done about Simon's journey. Maybe Cassandra has that planned in her crafty, creative, amazing mind. I hope she does. But that's why, to me, it felt a little incomplete. Clockwork Princess was sewn up to me. But City of Heavenly Fire didn't sew everything up and was a little lackluster. One thing my mom pointed out that was interesting is that eventually, Magnus and Alec have a discussion where Magnus decides he wants to share his past with Alec and gives him something he's written that's supposed to be the "first installment" of the stories of his past. Are these installments supposed to be what we're reading in The Bane Chronicles? I'm going to ask Cassandra via Tweet and see what I get. So kudos to my mom for picking up on that. So those are my feelings on CoHF. I loved the book, I thought it was great. It was just lacking a little something and felt less tight and resolute than Clockwork Princess, which to me, was a grand slam in YA lit. By comparison, CoHF was just a plain old homerun. 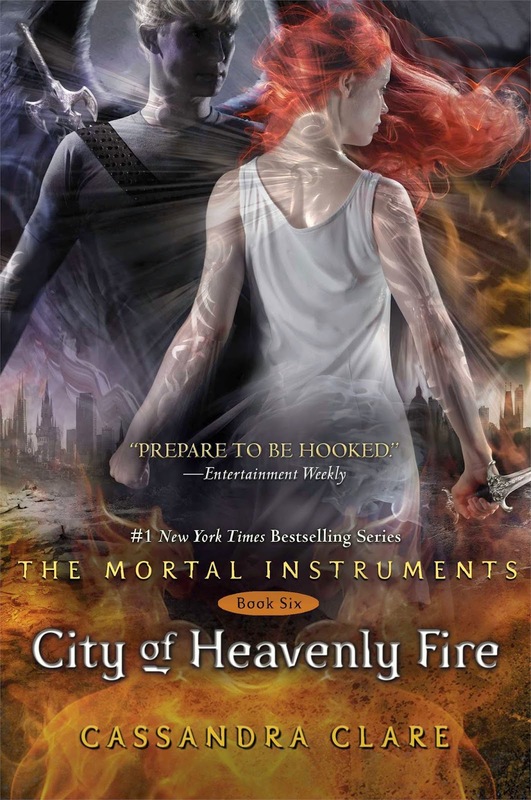 What did YOU think of City of Heavenly Fire? I gave it 4.5 out of 5 hearts.